(PhysOrg.com) --A team of researchers have discovered fossilized feathers from a giant penguin that lived near the Equator more than 36 million years ago. These feathery fossils reveal color patterns in an ancient extinct penguin species, and offer clues to how modern penguin feathers evolved. Paleontologists have unearthed the first extinct penguin with preserved evidence of scales and feathers. The 36-million-year-old fossil from Peru shows the new giant penguin's feathers were reddish brown and grey, distinct from the black tuxedoed look of living penguins. 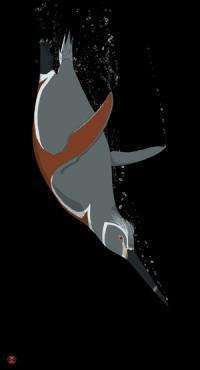 The new species, Inkayacu paracasensis, or Water King, was nearly five feet tall or about twice the size of an Emperor penguin, the largest living penguin today. "Before this fossil, we had no evidence about the feathers, colors and flipper shapes of ancient penguins. 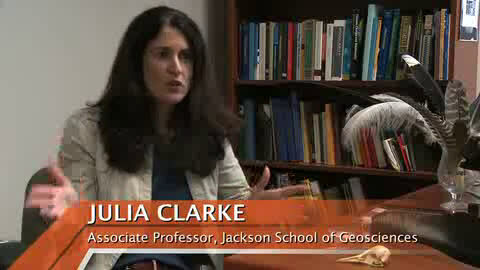 We had questions and this was our first chance to start answering them," said Julia Clarke, paleontologist at The University of Texas at Austin's Jackson School of Geosciences and lead author of a paper on the discovery in the Sept. 30 online edition of the journal Science. The fossil shows the flipper and feather shapes that make penguins such powerful swimmers evolved early, while the color patterning of living penguins is likely a much more recent innovation. Like living penguins and unlike all other birds, Inkayacu's wing feathers were radically modified in shape, densely packed and stacked on top of each other, forming stiff, narrow flippers. Its body feathers had broad shafts that in living penguins aid streamlining the body. Bird feathers get some of their colors from the size, shape and arrangement of nanoscale structures called melanosomes. Matthew Shawkey and Liliana D'Alba, coauthors at the University of Akron, compared melanosomes recovered from the fossil to their extensive library of those from living birds to reconstruct the colors of the fossil penguin's feathers. Melanosomes in Inkayacu were similar to those in birds other than living penguins, allowing the researchers to deduce the colors they produced. When the team looked at living penguins, they were surprised to find their colors were created by giant melanosomes, broader than in the fossil and in all other birds surveyed. They were also packed into groups that looked like clusters of grapes. Why, the researchers wondered, did modern penguins apparently evolve their own special way to make black-brown feathers? The unique shape, size and arrangement of living penguin melanosomes would alter the feather microstructure on the nano and micro scale, and melanin, contained within melanosomes, is known to give feathers resistance to wear and fracturing. Perhaps, the researchers speculate, these shifts might have had more to do with hydrodynamic demands of an aquatic lifestyle than with coloration. Penguin colors may have shifted for entirely different reasons related to the later origin of primary predators of extant penguins such as seals or other changes in late Cenozoic seas. Artist reconstruction of Inkayacu paracasensis. Illustration: Katie Browne. "Insights into the color of extinct organisms can reveal clues to their ecology and behavior," said coauthor Jakob Vinther at Yale University, who first noted fossil preservation of melanosomes in bird feathers. "But most of all, I think it is simply just cool to get a look at the color of a remarkable extinct organism, such as a giant fossil penguin." Inkayacu paracasensis (een-kah-yah-koo par-ah-kah-sin-sis) was discovered by Peruvian student Ali Altamirano in Reserva Nacional de Paracas, Peru. Inkayacu's body length while swimming would have been about 1.5 meters (five feet), making it one of the largest penguins ever to have lived. When the team noticed scaly soft tissue preserved on an exposed foot, they nicknamed it "Pedro" after a sleazy or "escamoso" (scaly) character from a Colombian telenovela. The latest discoveries add to earlier work by Clarke and her colleagues in Peru that challenges the conventional vision of early penguin evolution. Inkayacu and other finds show there was a rich diversity of giant penguin species in the late Eocene period (about 36 to 41 million years ago) of low-latitude Peru. "This is an extraordinary site to preserve evidence of structures like scales and feathers," said Clarke. "So there's incredible potential for new discoveries that can change our view of not only penguin evolution, but of other marine vertebrates." More information: "Fossil Evidence for Evolution of the Shape and Color of Penguin Feathers" Julia Clarke, University of Texas at Austin, Daniel Ksepka, North Carolina State University, Matthew Shawkey, University of Akron, et al. Published: Sept. 30 in Science.